Rather than run down to the Cineplex to see the latest Hunger Games installment (that will come later), I chose to spend Thanksgiving weekend perusing some old classics and one more modern parable. The classics where two films of Michael Powell (Contraband [AKA Blackout] and The Edge of the World) and one from Mihalis Kakogiannis (Zorba the Greek, based on the novel by Nikos Kanzantzakis). 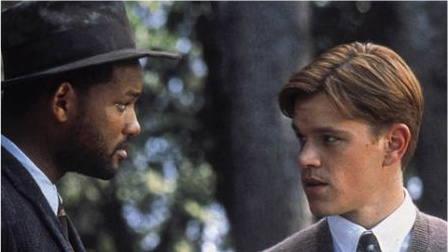 The modern parable was Robert Redford’s The Legend of Bagger Vance. The juxtaposition of these films got my mind percolating about how we as human beings make choices. Choices can be driven by desire, by love, by revenge, or by wisdom. They can also be fueled by the intent to have a positive influence on those around us. Or choices may seem forced upon us by external influences. In many ways, all stories, and all films, are about choice. But first a bit of history. What was interesting about Contraband is, for one, that it was a collaboration on a couple different levels, one short-lived, and the other more long-lasting. The short-lived collaboration was between Powell and the British Government, who were at that time (1939) in the thick of WW II and apparently attempting to coax neutral counties (i.e. Scandinavian countries) into siding with them against the Germans. The central character is a Danish captain (played by Conrad Veidt) of a ship marked as ‘contraband’ – its cargo to be funneled through Denmark and eventually to end up in Germany. The British were keen to limit contraband to the enemy, and let countries that provided contraband know that they were serious about quarantines of goods that might end up in the hands of Germans. The Captain’s choice rose out of tension between a sense of duty and love — duty to his ship and love for the mysterious Mrs. Sorenson, played by Valerie Hobson. Ultimately love wins, but so do the good guys. Powell’s other, more long-lived collaboration was with his director-writer-producer partner Emeric Pressburger, who Powell would later end up working with on several other classics, including The Red Shoes, and Black Narcissus. Better known as ‘fantasias’, these films show that Powell and Pressburger became less interested in realism and more in the underlying mythic archetypes that, to him, created the mental landscape of the human personality. While we find no such fantasy in Contraband, we do find a lot of humor. 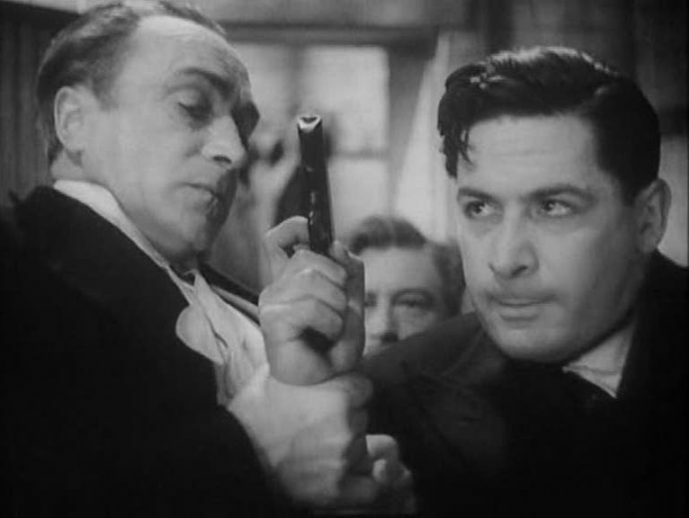 In fact, what struck me immediately about Contraband is how similar it was to another thrilling yet humorous ‘issue’ film surrounding the World War, Carol Reed’s The Third Man (1949), so much so that I am convinced that Powell’s film had a great influence on Reed and Graham Greene, the writer of The Third Man. Like Contraband, there is an ‘issue’ at play; like The Third Man there is a liberal use of humor an irony weaved within the suspense. With The Third Man the issue as tainted penicillin provided by the opportunist Harry Lime. The other great influence on both films would be Alfred Hitchcock, who is often credited with defining the spy thriller genre, epitomized with such films as Foreign Correspondent. Both Contraband and The Third Man focus on choice as the central arena through which the human story unfolds. For Contraband, it was the choice of the Captain to protect a woman out of love; in his case, it sided him with the good. For The Third Man it was the choice of Holly Martins (played by Joseph Cotton) to kill the nihilistic Harry Lime (played by Orson Welles) that becomes an emblem of the good man dominating the selfish one. Choice as a theme was also central to The Legend of Bagger Vance; for it is the moral choices made by the three golf players that ultimately define who they are. But more on that later. In Powell’s The Edge of the World, we find Scottish island people whose choices are infringed upon by external forces — even to the point of extinction (the population is eventually relocated to the mainland). In this sense they seemed to have no choice. Similarly, in Zorba the Greek, ‘foreign’ influences also threaten the village, finally resulting in the murder of the widow (played by Irene Papas), who ‘betrayed’ the village by making love to the foreigner Basil and indirectly causing the suicide of her murderer’s young son, who was passionately in love with her. If it were not for these external influences, her options, and her choices, would have been different. Parochialism, pride, revenge, the rule of the tribe, localism, intolerance are all thematic elements in both The Edge of the World and Zorba the Greek. Naturally arising compassion, outside of the patriarchal structures of the church and state, appears to be the only moral compass — and choice — that can guide us. It is the individual who awakens, with empathy, toward the plight of the other that lights the path ahead. 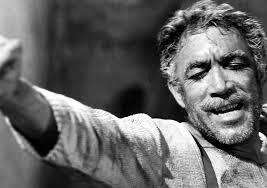 So it is with Zorba (played by Anthony Quinn), whose response to the harshness of life was not to attend church, but to dance and laugh. This is the wisdom he gives to the ‘foreigner’ Basil (played by Alan Bates), something wholly useless to the utilitarian needs of life but completely necessary to sustain life as a human being. The other option is to shut down: to murder the mystery of life in the name of control and ritualized obedience that has become so separate from its roots as to become the opposite of its origins. Thus, in contrast to the individualistic Zorba, the church going villagers in Zorba the Greek sing the praises of Christ’s forgiveness, while outside the church the widow who goes against the strict, and often unwritten, rule of the tribe is murdered for her transgressions. She is an emblem of freedom, in this case sexual freedom and choice that runs against the grain of the community– as such Zorba was a precursor to the sexual revolution that later occurred in Europe and the United States. Moreover, both Zorba and Edge of the World were prescient harbingers of the dangers of globalization; how cultures that have existed for hundreds of years can be swept into non-existence within a single generation — to have, in a real sense, their choices removed and/or replaced by other, more utilitarian, ones. Such is the power of the consumer culture and globalization that sweeps all inefficiencies into the dustbin of history, all in the name of economic progress. Both the villages of Zorba and Edge of the World were greatly influenced, if not destroyed, by these pressures. Many years later (2000), Robert Redford would take a nostalgic turn with The Legend of Bagger Vance, to make a modern parable about moral choice. One key scene in Bagger Vance is when Rannulf Junuh (played by Matt Damon) is made an offer by Walter Hagen (played by Bruce McGill) to play exhibition golf with him, with an ‘understanding’ that Hagen would always win the matches. As Hagen notes, ‘there is no meaning’ in life, and ‘people are only interested in entertainment’. Here Redford is indirectly taking aim at the Hollywood/Capitalist patriarchy that does not believe any kind of moral instruction is necessary to entertain the masses or to survive; in fact, if the film gives even a remote indication of the reality of exhibition golf, Mr. Hagen’s reputation never suffered from ‘giving the people what they want’. He died rich, well-respected, and well-loved. Junuh, on the other hand, made the choice to be honest, and take the penalty when his ball moved an inch or two on the final hole. It was this moral choice that he left for the little boy, Hardy Greaves (played by J. Michael Moncrief, who later grew into the film’s narrator, played by Jack Lemmon)—it is the power of choice that Hardy took away from the experience. As for the caddy, Bagger Vance (played by Will Smith), he left Damon at the last hole once he had learned this critical lesson, which again was not about golf at all, but about making the right choices. That, for human beings, can be a very hard thing to do. Good stories, whether they be told around the campfire in tribal villages, in Churches by priests and pastors, or in the movie theater, ideally give us road maps to better choices, and how to hold on to the freedom and responsibility that comes with them. Don Thompson is a producer/filmmaker and essayist. You can visit nextPix here.